In “Step 1: Find Your Number”, you have three options. Pick a free, instant activation toll free number; Pick a free, instant activation local number; or choose a custom vanity number. 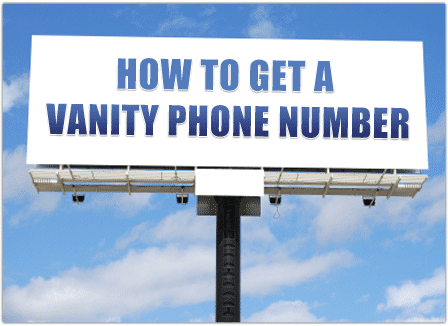 If you decide to select a custom vanity phone number, you can search by number combinations, words or phrases. When you find the number you want, you can reserve it with a click. 1. Vanity numbers are still popular, useful, and good for business. Why should you get a vanity number? Because it’s easy to remember. Here are two examples. If my internet goes out, I know I can call 1-800-XFINITY and get customer support. If my car runs out of gas I know I can call 866-COUNTRY and get roadside assistance. Country Insurance and Comcast don’t expect their customers to remember their phone numbers to get help and neither should your business. 2. Vanity phone numbers are usually toll free numbers, not local DIDs. Local vanity numbers do exist but they are not common and the reason is simple. Local numbers are not housed in a centralized database like toll free numbers are. So companies like UniTel Voice or AT&T, or whoever, cannot search all available local numbers at one time. 3. You may not find a vanity number with the area code you want – but that doesn’t matter. When it comes to selecting a vanity number – don’t get hung up on which toll free prefix (or area code) is best. What matters is the word or phrase your number spells. In many cases, older area codes like 800 or 888 are all in use and your best option is one of the new options like 855, 844 or 833. Because 833 numbers are the newest released toll free numbers, they, therefore, have the most vanity number options available. 4. UniTel Voice can help you find a great number. Our vanity phone number search tool has an API with the national toll free number database (where all available numbers are stored) that allows you to search for available numbers in real time and instantly reserve the one you want with a click. You can search the availability of virtually every vanity number in North America in an instant and if you find the number you want, you can reserve it with a click. If you can’t get the vanity number you want because someone else has already snapped it up, our search tool will give you some close vanity number alternatives that are available for purchase. And if you need extra help, our support team would be happy to help you brainstorm phone number ideas and search for you at no charge or obligation to buy. With UniTel Voice you can quickly find and activate your vanity number, try our phone service risk-free for 30-days, and down the road, if your needs change, you can transfer your vanity phone number to another provider with no cancelation fees or contracts locking you in. Because with UniTel Voice, you own your number – no string attached.